Reduced from $110.00. .55ctw Natural White & Pink Sapphire Ring in Yellow Gold. Certificate of Authenticity is included. All Sapphires are natural and not lab created. The sapphires are clear, bright and sparkly. Purchased a long time ago from Gems TV when it was still live on the air. 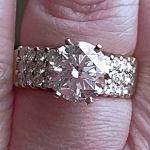 This ring can be worn alone as a RHR or can be worn with a band or stack rings. Gently worn pre-owned condition.